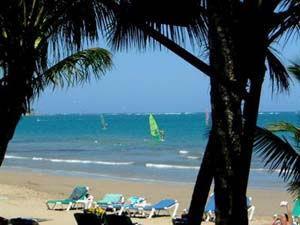 Cabarete, home to kite surfing and wind surfing in the Caribbean. Cabarete is a small idylic Caribbean village nestled on the shores of the north coast of the Dominican Republic. Only a 25 minute drive from Puerto Plata International airport, this town is fast becoming one of the 'hottest' destinations in the Caribbean, appealing to both young and old alike. Set back off the beach are a wide range of bars, restuarants and hotels that have sprung up in recent years to cope with the increasing demand. Not a surfer? The activities available locally range from scuba-diving, mountain-biking, quads or just lazing around on the golden beach enjoying the rays of the sun, with a bottle of Presidente in your hand. While Sosua attracts people looking for villas for holidays or full-time living, Cabarete specialises in apartments for fully managed care-free living and easy rentability in your absence. Cabarete Bay is home to a number of oceanfront projects including condo projects such as Ocean Dream, Ocean Point, Cabarete Beach Palace, Ocean one and Millenium amongst others. Villa projects in the area include Sea Horse Ranch, Perla Marina, Encuentro beach (Vista del Caribe). On the south side of the main road, Lomas Miranos Costa Azul and Pro-Cab can be found. Most of the team in the office are owners or live in these projects due to the ease of living and access to all of Cabarete amenities. Some of the agents in the office also keep condo's available for rent due to the high annual demand in the well managed projects, recieveing a good level of return on investment. Cabarete is the ideal location for action sports, as well as a great place to relax, get a tan and enjoy a nice meal in one of the many restaurants on the beach. Kiteboarding – Cabarete is a kite boarders paradise! Many enthusiasts from all over the world head there to experience this new water sport. Windsurfing – This activity put Cabarete on the sporting map and the north coast is now racked among the 10 best sites in the world. Surfing and Boogie-Boarding – The safe, clear, warm waters with uncrowded waves make this a very popular sport on the beaches just outside Cabarete. Wakeboarding – Ride on the perfect wake on a flat river in tropical surroundings. Mountain-biking – an internationally renowned local firm offer daily excursions ranging from beginners trails to advanced level rides through the bush. Dirt biking/Motocross lessons/Enduro tours – The mountainous terrain behind Cabarete is heaven for dirt bikers! Motocross professionals in Cabarete have all the equipment you need. Horseback riding- There are several ranches offering horseback treks both along the beach and through the countryside. Golf – There are several golf courses in the Cabarete area, including the Playa Grande course and the Playa Dorada course, both designed by famous golf architect, Robert Trent Jones. Caves – The Cabarete Caves are part of the El Choco National Park. There you will find guides to show you around the caves and relics of Taino natives – the original pre- Columbian inhabitants.